Tropical Rainforests are truly one of the Earth’s greatest treasures. These precious places are home to over half the species of plants and animals on the planet. They provide us with oxygen, help maintain our climate, and give us delicious foods and life-saving medicines. They are essential to life on Earth as we know it. And they are rapidly disappearing! Scientists estimate that humans destroy at least one acre of Rainforest every minute, a rate which could easily result in their complete destruction within our lifetime. The forests are being cleared to make room for cities and roads, farms, plantations and ranches, and with the trees go thousands of plants and animals that can live nowhere else. Click here to print out a Rainforest Facts study sheet for your students. 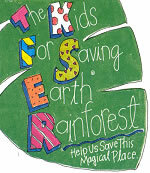 Click here for photos of your Kids for Saving Earth Rainforest. Click here for an educational video about the Rainforest for kids. From lush valley growth to misty mountain cloud forests, Costa Rica is blessed with some of the Earth’s most beautiful and valuable Rainforest. The variety of life here is astonishing, from beetles to birds to bats, from snakes to vines to plants with healing powers, six-foot lizards, monkeys, mushrooms and beautiful exotic flowers. A variety of life so rich we have only begun to know a fraction of it. Costa Rica has a stable, democratic government. It has a growing National Park System. This is important because this investment to protect Rainforests, with proper care, including education programs, trail systems, guards, and fences, means that it is to stay a Rainforest. It is here in Costa Rica that Kids for Saving Earth Worldwide has chosen to support an area which has been designated as the Kids for Saving Earth Rainforest. This area is included in the Braulio Carrillo National Park, which is part of the Costa Rican National Park system. 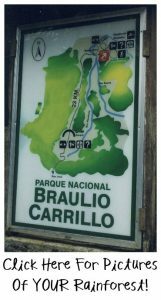 Costa Rica’s “Braulio Carrillo National Park” is a protected area of great biological diversity. Conservationists from many nations are working to extend its protecting boundaries into neighboring forest land that could soon be lost to development. The Organization for Tropical Studies (OTS) facilitates the Kids for Saving Earth Worldwide Rainforest Program to protect this land through fences, trails, and guards as needed, a crucial education program by OTS for the surrounding Costa Rican communities and a worldwide education program by KSE, and the purchase of Rainforest land. We have also recently added an option for you to help support specific schools located in the communities surrounding the KSE Rainforest areas. Click here to learn more about this option to support and communicate with these schools. Please Join Us In This Vital Mission! Almost every minute of every day, another acre of Rainforest disappears forever. We may never learn about countless living treasures, all precious to the future of our planet. Please help us preserve these treasures today, for all generations to come. Here are some ways to earn funds for the KSE Rainforest. You can donate to the Kids for Saving Earth Rainforest by clicking here. If you want to donate by check or money order, click here to fill out the form, print, and mail to the address below.